Image Size: 24 X 15.5 in. “They came from our secret base at Shangri-La,” replied President Franklin Delano Roosevelt when asked by reporters where the “land-based” bombers of Lt. Colonel “Jimmy” Doolittle’s raid had originated. In reality, Shangri-La was the USS Hornet and the idea of launching B-25s from an aircraft carrier was the result of determined and superb inter-service conception, planning and execution. It is now 70 years since the USS Hornet’s loudspeakers blared, “Army pilots man your battle stations for take off!” Task Force 16 had been detected at 7:38 AM April 18, 1942, a staggering 170 miles short of their estimated point of departure, by the Japanese picket boat No. 23 Nitto Maru. The decision was quickly made to launch the attack early. Doolittle’s aircraft, the first to go, roared down and off the deck of the Hornet at 8:20 AM. Fifty-nine minutes later, by 9:19 AM, the sixteenth plane, under the commanded of Lt. W.G. Farrow, was headed towards Japan. To celebrate the 70th Anniversary of this historic event the five surviving Doolittle Tokyo Raiders will gather at The National Museum of the US Air Force at Wright-Patterson AFB April 17- 20, 2012. Consider this: of the 80 officers and crew that flew the one-way mission into enemy territory that day, there remain today only enough airmen to man a single B-25. William S. Phillips’ "Rising Into the Storm" places us just off the bow of the Hornet seconds after Doolittle’s B-25 has left the deck. The atmosphere moments before had been tense. While two test take-offs from the ship had been performed months earlier off Norfolk, VA, those aircraft were not fully laden with fuel, bombs and crew. Throttles at full power, flaps down and his B-25 straining against its brakes, the plane rattled and roared as Doolittle waited for the release from the flag man. When the signal was given, it was timed so that the carrier would be surging up on the crest of a wave as Doolittle’s plane left the deck. The joint velocity of the aircraft, ship and headwind pushed 50 knots. As Doolittle cleared the bow, a wind blast combined with the nose-high attitude they practiced, shot his Mitchell bomber sharply up in the air. He leveled out before stalling just as the mighty Hornet crashed back into the sea. There are two separate editions of Rising Into the Storm. The Fine Paper Art Edition, to be countersigned by the Raiders attending the 70th Anniversary Reunion, measures 27 X 23.5 in. and is limited to an edition 200. 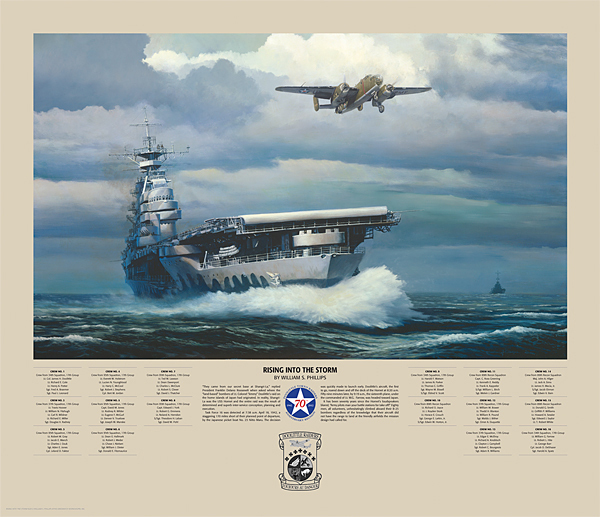 Designed into the border area of this print, along with the real signatures of actual Raid participants, is a complete roster, by plane, of the original Doolittle Raiders. The Fine Art Giclée Canvas is a stunning 36 X 22 in. and looks and feels like the original work of art. This edition will be signed by the Raiders attending the 70th reunion and is limited, in honor of the event, to an edition of 70. Nearly three quarters of a century ago, 80 men, all volunteers, unhesitatingly climbed aboard their B-25 bombers with the full knowledge that their aircraft did not have the range to land at the friendly airfields the mission design had called for. It is a sense of duty that any service member can relate to; theirs is a job where uncommon acts of valor are common place. Of those original 80 airmen, only five remain. Purchase this piece of history before time passes you by. Royalties from the sale of these or any other Doolittle Raider Fine Art Editions support the Doolittle Tokyo Raider Scholarship Fund.